A good friend of mine organises a Craft Fayre every Christmas and makes a lot of gorgeous items herself for it. 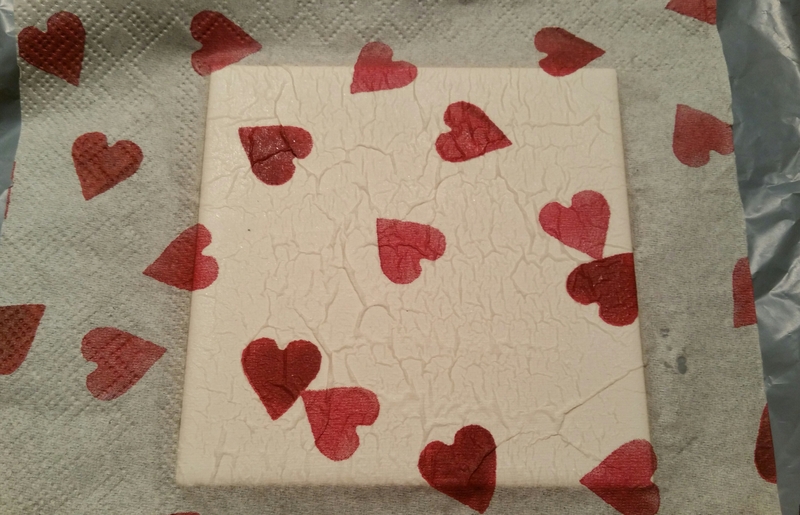 A few years ago she started making these coasters and I was knocked out by how easy it was to get such a lovely result! 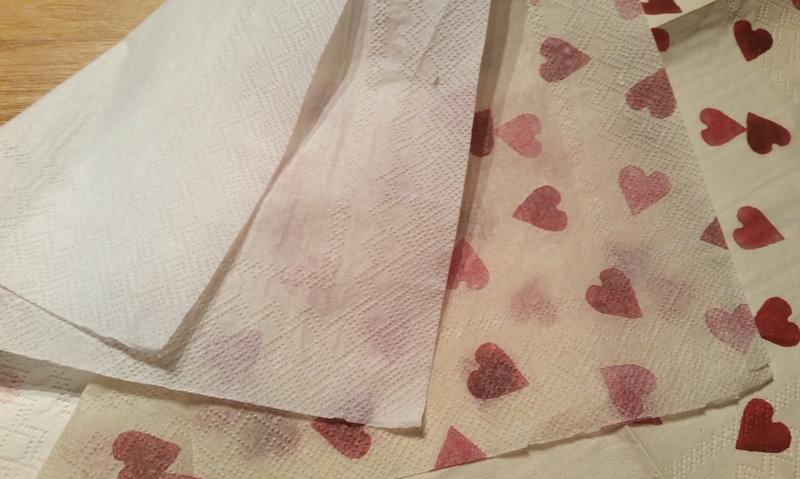 She used any pretty napkins but I absolutely love designers such as Emma Bridgewater and Cath Kidston, so I decided to only use designer napkins. I became a bit addicted to making them and lots of people asked to buy them. 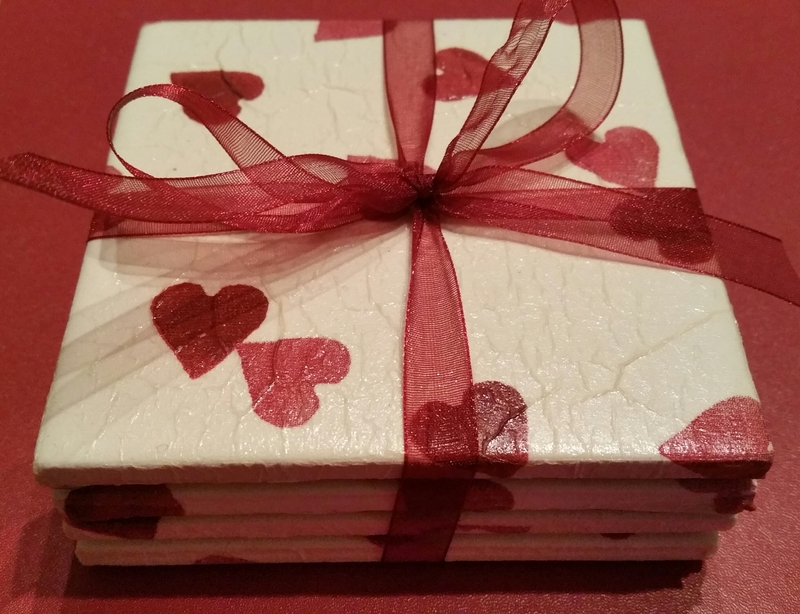 I gave sets of 4 to people as gifts, and love going to their houses and seeing them on tables and tops of cabinets, still in use and looking like new. They really are simple to make, and with Mother’s Day coming up soon, why not surprise your own Mother with a practical gift made with love by you? Chocolates get eaten within a few days, flowers fade and die, so how about this year making and giving a gift that will last? I’ll include photos of every step of the process so you know you’re doing it correctly, but I’m sure you’ll have no problems anyway. 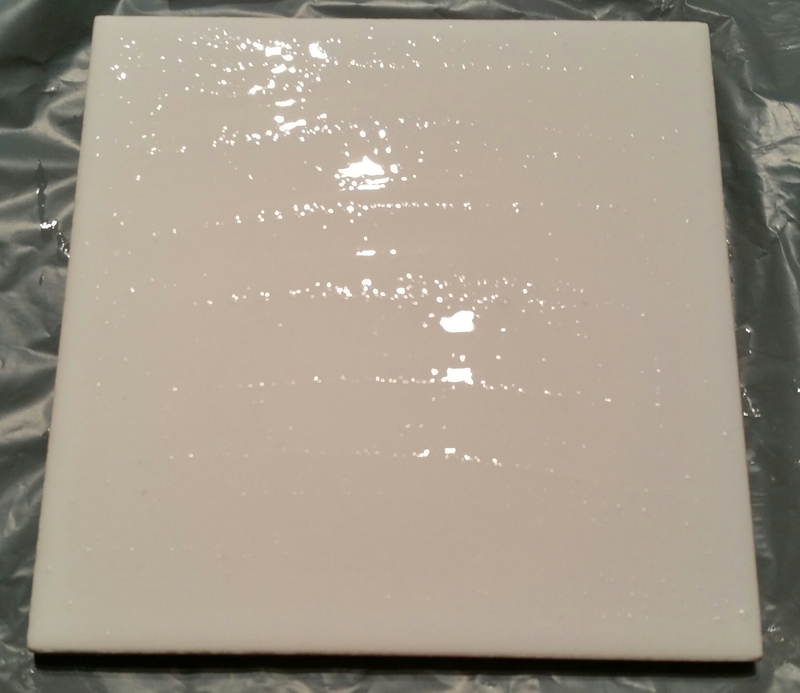 To make a set of 4 coasters you will need 4 plain white tiles measuring 100mm x 100mm. You can buy a box of basic tiles from large DIY stores such as Homebase or B&Q. (I buy mine from B&Q at £5.50 for a box of 25). You will need 1 paper napkin of your choice measuring around 30cm. All the ones I ever use are 33cm square, and 3 ply (made from 3 layers of paper). Mix PVA glue with an equal amount of water in a small pot. This will be used to stick the napkin on to the tile. Open out your paper napkin and cut along the fold lines so you have 4 equal squares. 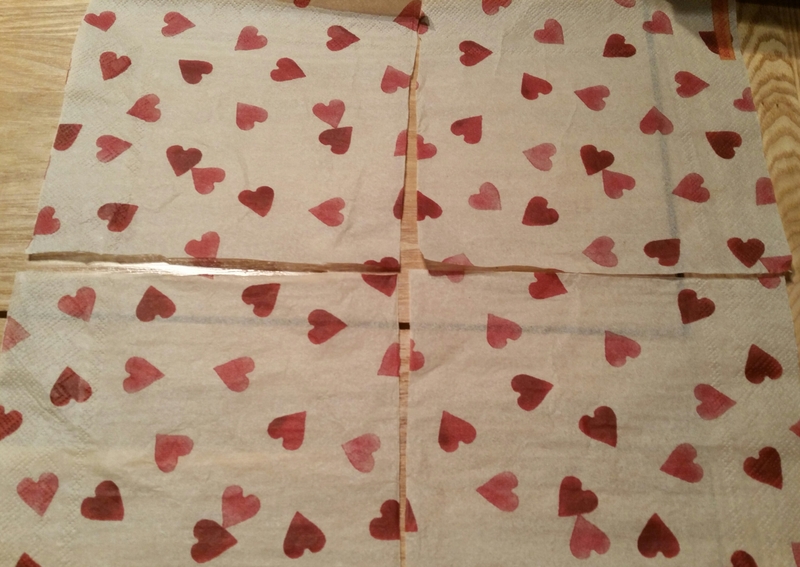 Very carefully, peel away the top layer of paper from each square. This is the piece you need for the coaster as it has the design on it. If you stick all 3 layers on, you will get bubbles and it won’t look as pretty. Keep the other layers to use later on. 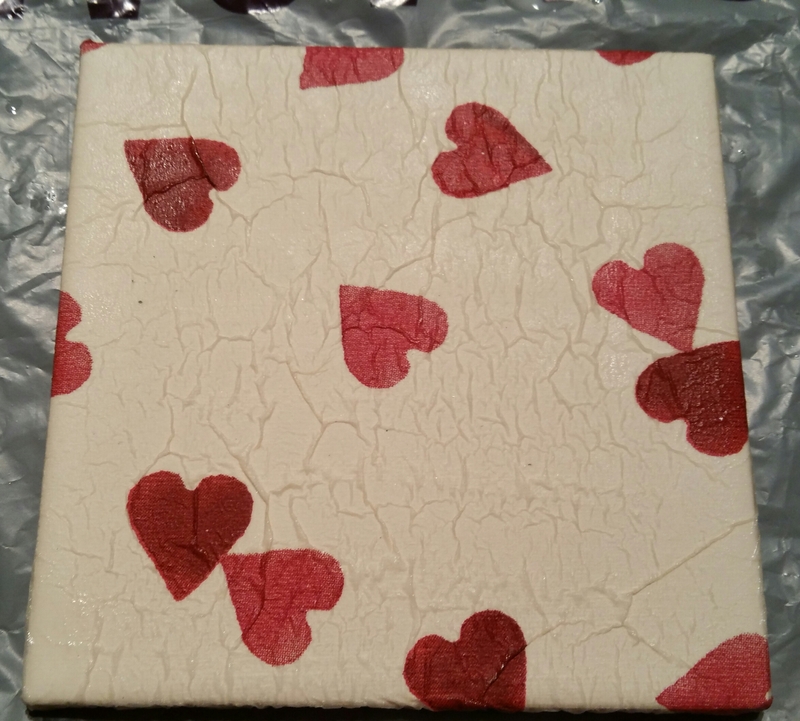 Take one tile and completely cover it with the PVA mixture using the paintbrush. Make sure you cover the edges too. 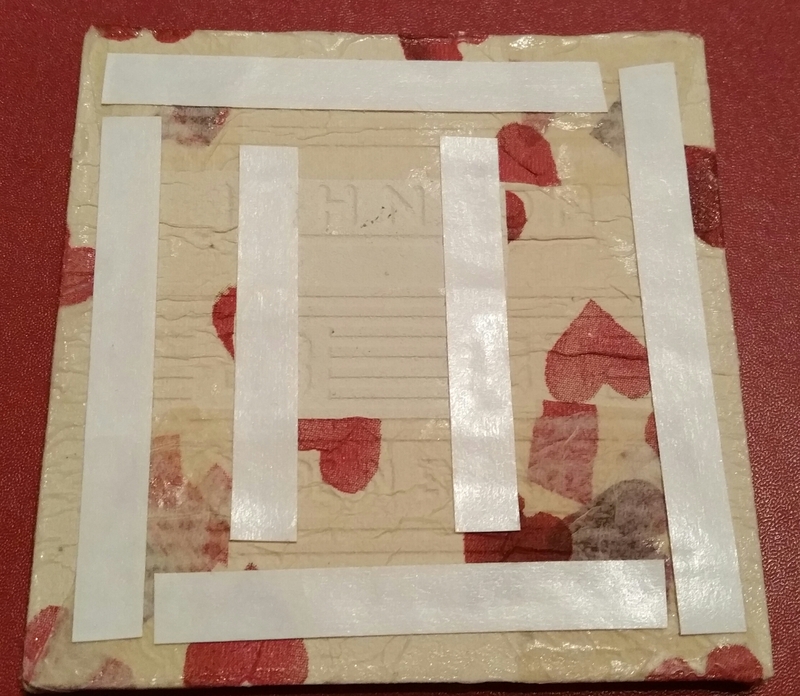 Take one of the top layer squares you gently saved, and position it on top of the tile so you have the best part of the design on display. Make sure there is enough around the edges to fold underneath in the next step. Scrunch some of the plain layers of napkin (the bottom layers) into a loose ball and very gently dab the napkin on to the tile. You will get creases, but that adds to the overall look so please don’t try and straighten them out. If you try and move the napkin at this point, it will rip. When the napkin is in place, carefully pick the tile up and turn it over. 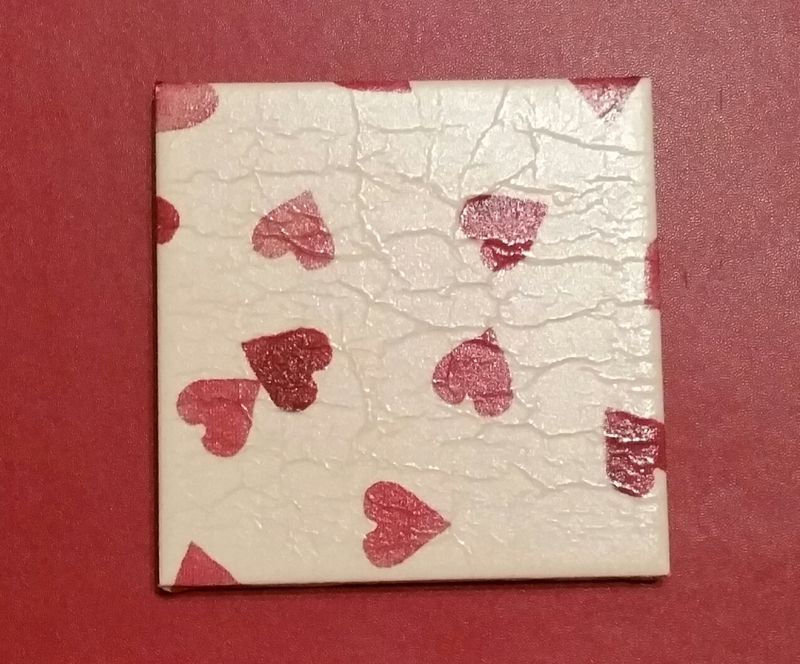 Brush more PVA glue on the bottom of the tile and fold the edges of the napkin on to the glue. You can either dab the edges down with the scrunched up layers, or use your paintbrush to smooth them down. I use my brush for this stage. Make sure there are no air bubbles on the sides of the coaster. If there are, very gently smooth them down with your brush. Leave on a plastic bag or similar covering to dry. When the top is dry, turn it over so the bottom completely dries too. Repeat all the above steps for the other 3 coasters. When they are completely dry, coat the top and sides with the varnish. It brushes on easily, has no nasty odour, and is non-yellowing, which makes it the best for your coasters. I brush on 3 coats, allowing each to dry in between coats. You can brush on as many as you want to get the sheen you want. Leave the coasters to dry overnight. 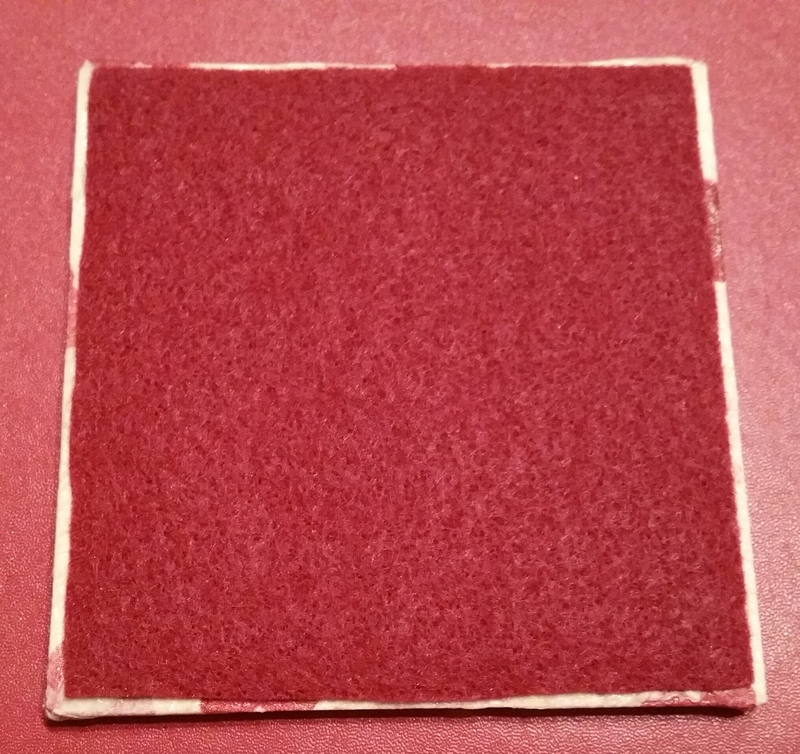 Cut the felt into 4 squares, just slightly smaller than your tiles. 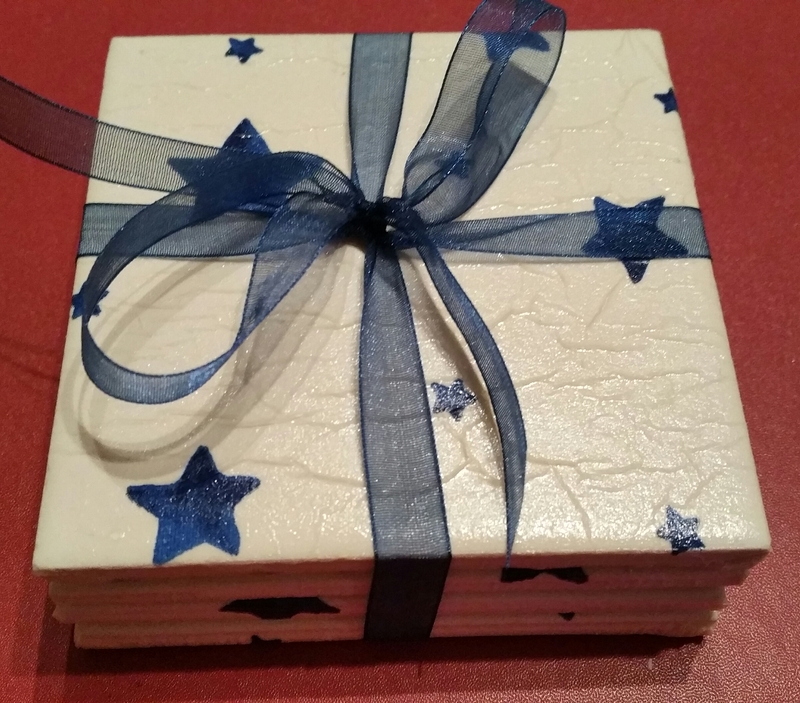 Place strips of double sided tape on the backs of the coasters. Peel the backing off the tape and position one square of felt on each. Press down firmly. And that is the coasters complete! 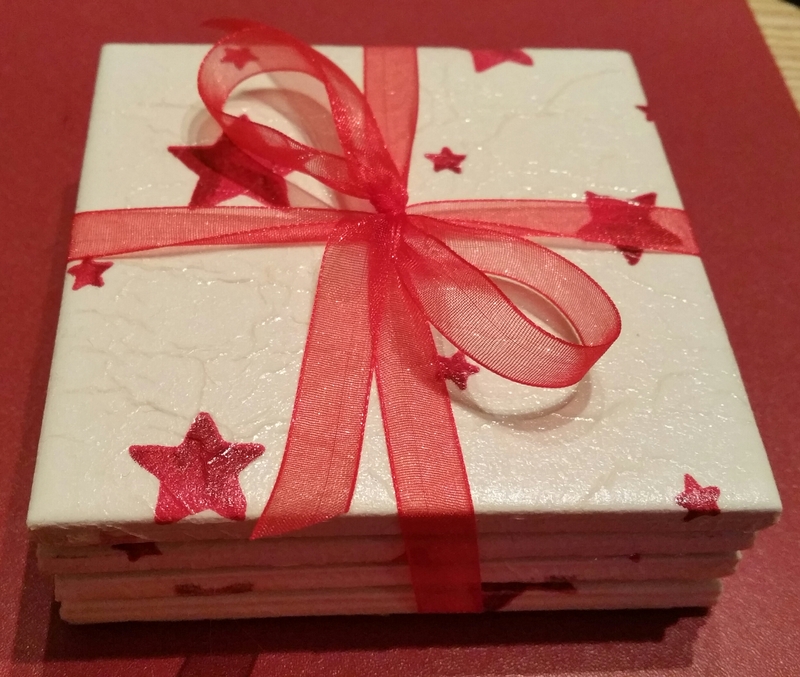 To present them as a gift, stack the 4 coasters on top of each other and tie a ribbon around them. And there you have a wonderful gift to give for any occasion. My son has given his past teachers a set at the end of the school year as a thank you gift. 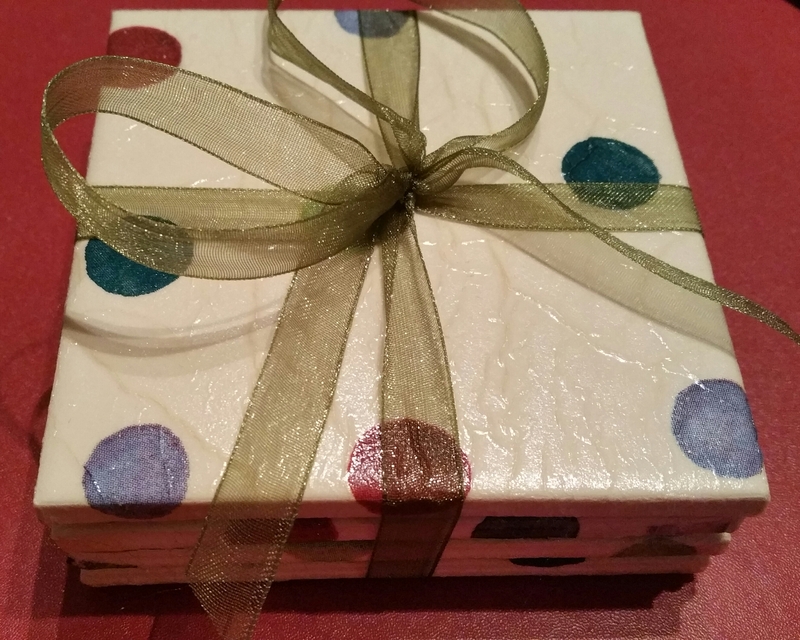 I’ve given sets as housewarming presents and as a gift for my Mother-in-Law for Mother’s Day. I have a lovely friend who adores Emma Bridgewater designs, so I made a set for her just for being such a wonderful friend! The felt on the back protects your surfaces from scratches from the roughness of the underside of the tiles. You can use cork sheets if you prefer but I like the way you can use matching colours of felt. 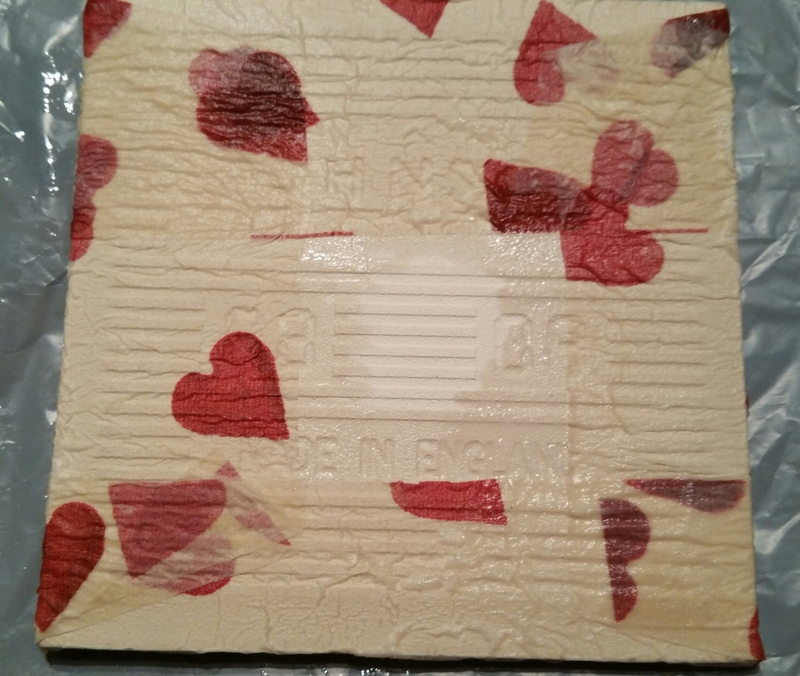 The polyurethane varnish will protect the coaster from drips, and is easy to clean with a damp cloth. I hope you enjoy making these. I’d love to hear how you get on and who you give them to! Happy Crafting! This is a lovely idea. I am certainly going to give it a try.